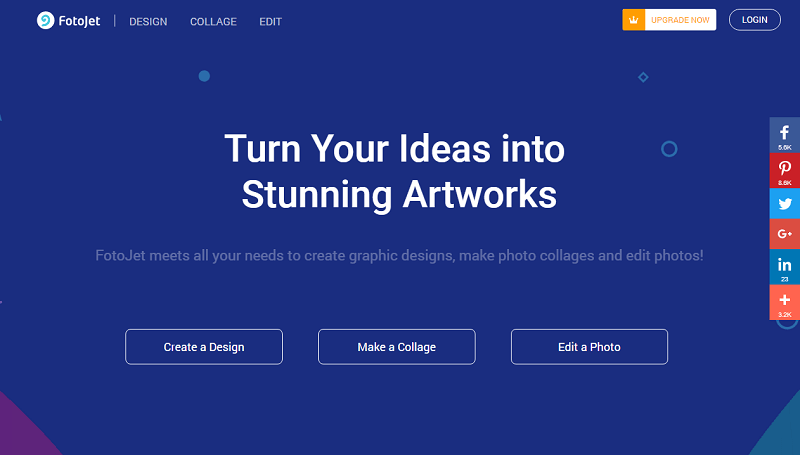 I was recently (OK, a couple of months ago *cough*) asked to review Fotojet, an online graphic design and photo editing platform that is similar to Canva and PicMonkey. I’m all about finding stuff I can refer others on, so I was more than happy to take a look. Full disclaimer: while I was asked to review Fotojet, I wasn’t given anything in return, other than a temporary Fotojet Plus account so I could click around and look at all the features without restriction. 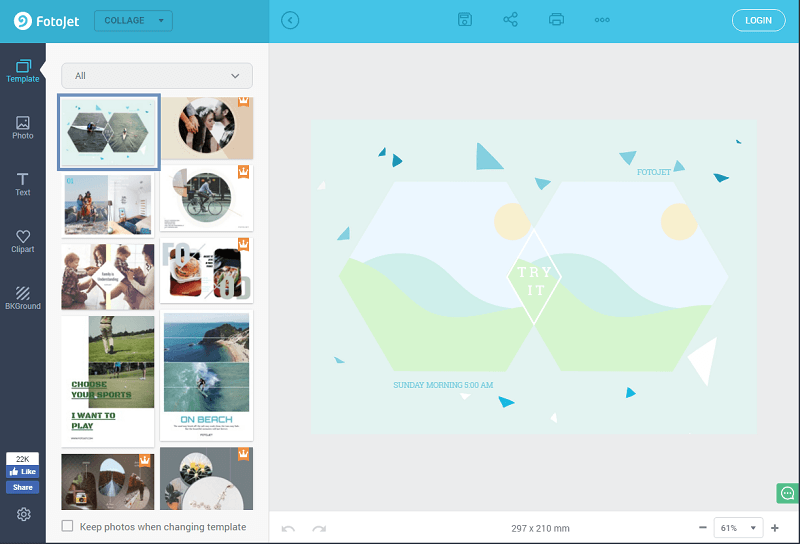 If you’re familiar with either Canva or PicMonkey, you won’t have any problems navigating around Fotojet. The layout is very similar to both platforms, and the basic features are also comparable. It’s really simple to start a new project. On the homepage of Fotojet, you are immediately given the option to create a design, collage or edit a photo. If you are just using the free version, then click on one of the buttons to get started. If you have the premium account, log in at the top of the page first. The Fotojet makes it super simple to start a project, with links in the navigation and also huge buttons above the fold, which you can’t miss. Placing the most popular design options at the top of the page means less time scrolling, and more time being productive. Once you are in the design screen you have a choice of templates you can start with, or you can create from scratch. There are a number of free templates, and premium templates are marked with a crown symbol (similar to PicMonkey’s icon). You can add photos from your computer, from your Facebook account, or you can use the Pixabay search feature, which gives you access to more than 580,000 images. Like Canva, you can choose from Headings, Subheadings and Body text, which autopopulates a default font. Once your text box is added to your project, the editing feature pops up. There are a number of fonts to choose from in the free version, and again, premium fonts are marked with a crown icon. You can edit the colours, size, etc, and you can also move the text up and down layers, change the opacity, and give the text an outline or glow. You will also see that there are some text templates that have already had these features applied. I personally wasn’t a fan of the template options available in that regard, and preferred to tinker with the text on my own terms. There is an assortment of clipart options available, along with a search function to look through 93,000 clipart files online. The in-built clipart images are grouped by category, and then by free and premium. The effects enable you to change the colour of the clipart files, along with opacity. You can also flip the layer, copy it, and move the layer back and forth, the same as you can with your photos. Finally, backgrounds are a simple matter of clicking on them to apply the pattern or colour. You also have the option to create your own gradients or colours if the default options don’t work for you. Once your design is finished you can save the file to your computer as a JPG or PNG, share it straight to social media, or print it. To save the project to Fotojet for later use, you need to upgrade to a premium account, which is a downside from Canva’s free option. This means that if you want to jump from one design to another, you need to finish your current design first, download or share it, and then move to your next project. I was pretty impressed with the Collage options. Not because of the choice of templates, but because of the style of them. With the exception of the comic book and fun photo options, nearly every template incorporated clean design, and modern design features. The template thumbnails show images, but when you load the template those images aren’t there. The thumbnails merely give you an idea of what the potential is for that template. Collage templates make it simple to add a photo and make simple changes to achieve a killer, modern look. At the same time, you’re not limited to the layers provided. Add more photos, clipart or text to really customise your project. You can switch between templates, and you have the option to keep your photos as you move around templates. This saves you from having to reimport those images with every template change. As with the design screen, you have the option to add photos, text, clipart and backgrounds by clicking on the tabs on the left hand side of the page. Photo editing is really easy with Fotojet. With a choice of basic options in the free version, you can quickly crop, resize, adjust the colour and exposure. There are built in effects that you can immediately apply, and a myriad of options for overlays, frames, text and clipart. You can also adjust the amount of the effect, so you can soften it if you want it to be less apparent. And of course, there are premium features that are worth upgrading for, including adjusting the focus, adding or reducing noise, vignette and a sharpen tool. This is probably my favourite feature of Fotojet. Quickly jazz up your photos in seconds with in-built options, and if you want more control, you can make manual adjustments. In a matter of a couple of minutes I was able to change a simple photo of a cat to something that artistic, simply by using the in-bult textures in the premium version. Fotojet has done a pretty good job of providing support articles to help you navigate around its platform. You can also access the help docs when you are using Fotojet by clicking on the gear icon in the bottom left-hand corner of the screen. If you need to access the help documents while you’re in the middle of designing something, the gear icon has you covered. With the free version you are restricted to the default sizes available when you choose your project option. You need Fotojet Plus if you want to create a custom size project. With a Fotojet’s Plus account you can save and load projects from your computer. This means you can’t access your projects if you are on a different computer. 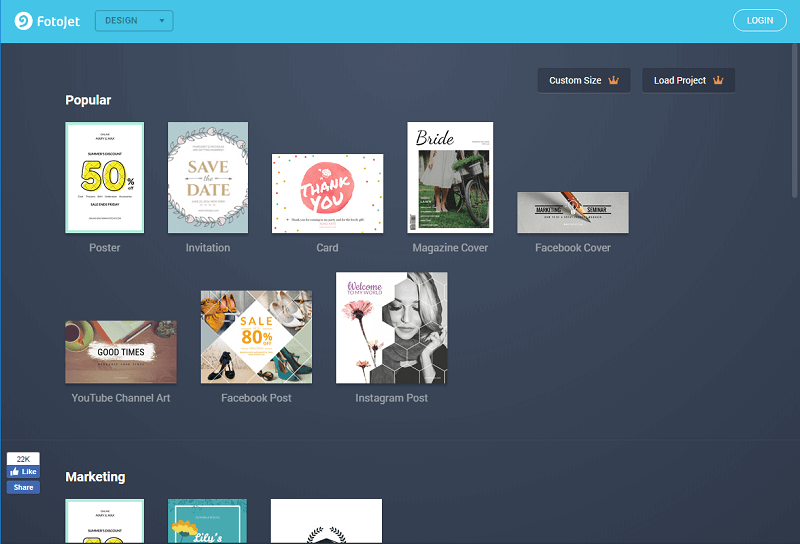 This differs from Canva, where the projects are saved in their system, which means that you can access those projects anywhere, from any computer. It’s a small, but important difference for people who rely solely on cloud-based software. Fotojet Plus also entitles you to have access to hundreds more templates and resources, priority support, and you won’t have to view ads. The key thing about Fotojet Plus is that it’s cheaper than Canva or PicMonkey. So if you’re on a budget, check out Fotojet first! 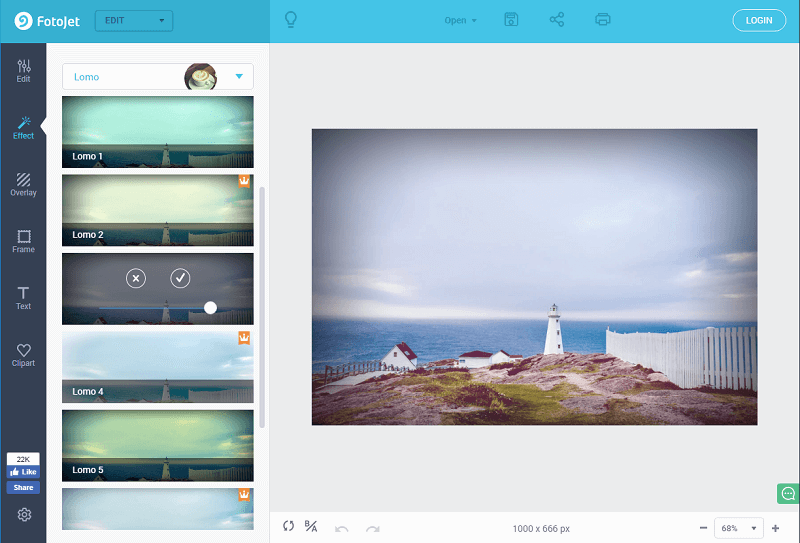 I would say that in terms of premium features, Fotojet is closer to PicMonkey than Canva. FotoJet has a very similar feel to PicMonkey, and the one thing that currently stands out is PicMonkey’s ability to use fonts from your computer. PicMonkey Premium (and the next level Supremium) enable you to save your projects in their “hub”, rather than saving the project files on your computer, like you have to with Fotojet. With PicMonkey, you need to have an account if you want to export or save anything, whereas Fotojet conveniently lets you use the free version without creating an account. 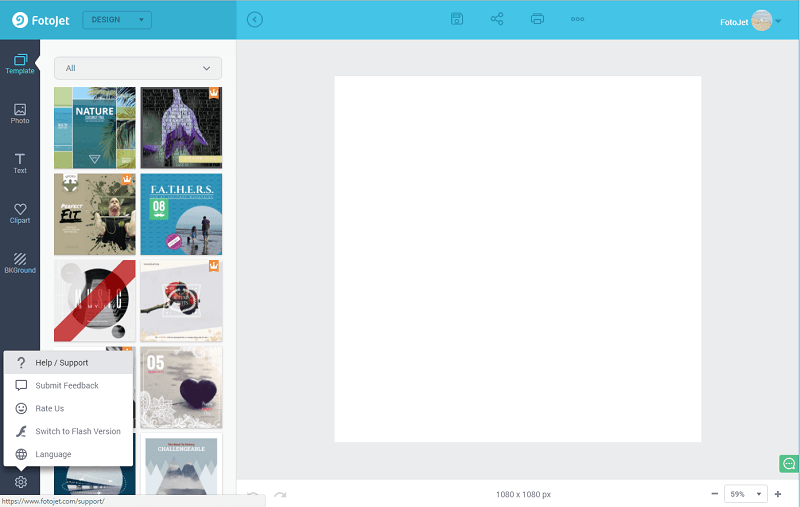 Canva has a few additional features that make it a little more superior, such as the ability to make multi-page documents for e-books that can be exported to PDF. Canva for Work enables you to set up your branding to use across the board, including uploading your custom fonts and logos. It also has the capacity for team sharing–which is key if you have a small team, ability to create image folders, and magically resize your templates to save time creating a new image for every social media platform. If you are designing simple social media images or quickly editing photos, then Fotojet is a fantastic option to start with. With its ability to create images and save or export them without creating an account, the free option is a great starting point. Fotojet Plus takes you to the next level with a cheaper price point than PicMonkey, which makes it the ideal option for those who are on a tight budget, or who despair over currency conversions from the US Dollar.